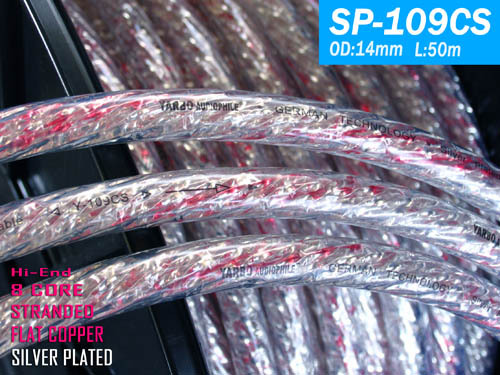 The SP-109CS uses a flat-plated sterling silver core copper core wrapped with airtight and transparent hose, and then twisted into a regular 8-shaped shape, the eight core stranding process is very difficult, not by the general factory can be manufactured. This line is not only silver and red positive line standard, the twisting of the lines more streamer flashing beauty, it seems coordination of extravagance, the details are also easy to use. This speaker line features ultra-low impedance, ultra-low inductance and ultra-low capacitance. Line up to 14mm, but very soft. Although the structure of the SP-109CS seems simple, it can be seen through the inside and outside structures at a glance. However, designing a silver-plated square copper flat wire with a sterilized silver body and twisting it is a great idea. Convincing. This line has a very unique sound balance, the thickness is very moderate, smooth and natural melody of music, high frequency to reach the utmost, the sound field is very wide, the instrument overtones are also significantly rich, the sound naturally has a better authenticity, especially Is the recording of some live performances, immersive feeling more intense; and SP-109CS low-frequency extension is also excellent was commendable, excellent analytical power, from high to low smooth and smooth range, pure and crystal clear sound , Not only able to clear the music information clearly structured fax, without the slightest vague, even the usual humble details also revealed very clear and natural; this line to listen to the details of the instrument will be more clear, light percussion more pronounced, The positioning and front and back of the hierarchy is also clearly presented, YARBO / SP-109CS is a rare on the market can reproduce the wonderful music Hi-End value line.